In spite of the fact that I’ve become quite entranced by Olympic viewing over the past week (Bilodeau! Ricker! Go Canada go!) my friend K and I were in agreement that when it comes to snow, doing is always better than watching. So we set out bright and early on Friday morning, and left Vancouver, the Olympics and Canada behind to head over the border to Washington State. After a few wrong turns and the regrettable decision to breakfast at Jack-in-the-Box (in our defense, neither of us had ever eaten there before and had no idea how awful it was going to be) we arrived in the Baker parking lot on an absolutely perfect bluebird day. During my only other visit to Baker it had puked from first chair to last, so this was my first opportunity to actually get a look at the surrounding area. First impressions, which only strengthened during the day, were that this is one of the most stunning locales I’ve visited. With Mount Shuksan towering behind, snowy ridges and peaks on every horizon and untouched backcountry powder as far as the eye could see, we couldn’t have asked for a better setting. Between the remnants of my cold and K’s injured knee neither of us was riding at capacity, but it was such a beautiful day it didn’t matter. The sun was warm, the scenery beautiful, and it was hard to believe it was February and not April. The groomers were in good shape and the sun-warmed snow was a joy to ride, but some of the runs I was most looking forward to – the Canyon and Gabl’s – were in the shade all day, and stayed hard and icy. We dropped into the Chute a few times over the course of the day, and after an unpleasantly hard and scrappy run down in the morning it improved significantly in the afternoon. I spent large amounts of time trying to persuade K that the “Extreme Danger Zone” signs were a challenge rather than a warning, and finally made it in shortly before last chair. My reward was two untouched lines through the bowl to the Chute; the sun-warmed snow was too sticky to qualify as powder, but at speed it was beautifully surfy. One of the highlights of the day was arriving at the top of C-8 just in time to see a skier front flip off a 20-foot cornice onto a 50-degree face. It was one of the more impressive feats I’ve seen, especially as the snowboarder who followed immediately after yard saled spectacularly. With clear skies, it was easy to see why Baker has such an enviable reputation as a backcountry destination; there were gorgeous, untouched lines everywhere we looked, just 15 or 30 minute skins from the top of the chair. Over the course of the day we saw silhouette after silhouette pause on the skyline and then carve a line of beautiful s-curves down and out of sight. It cemented my resolve to get a full AT rig together, do some avalanche training, and get into the backcountry next season. I really want to start earning my turns. Baker is in an east-facing bowl, and as the evening sun sank behind the ridge and the shadows gathered on Mount Shuksan the temperature plunged and the sun-warmed slopes froze solid. I coasted down the final run and snapped a last few pictures of Shuksan Peak before we piled our gear in the truck and turned back toward Canada and home. It’s hard to be away from this crazy Olympic city right now, but given the choice I’d always rather be where the snow is. 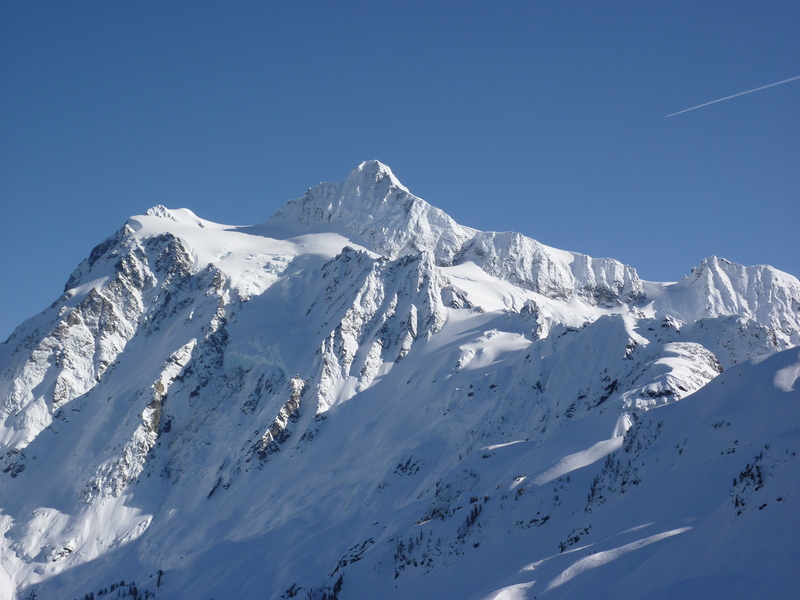 This entry was posted in Mount Baker, Skiing on February 22, 2010 by Kay. On Saturday B and I strapped our skis into his truck and headed to Mount Baker in Washington State. After flashing my shiny new Canadian passport at the border guards (the first time I’ve used it) we made our way through trees heavy with spanish moss and rain in Mount Baker National Forest. Halfway up the winding highway the rain turned to snow, and didn’t let up all day – snowflakes the size of quarters rained down on us from first chair to last. The snow was a little heavy and wet, but there was as much of it as we could possibly want. First impressions of Baker, in keeping with the monster snowfall, were very positive. It’s definitely a locals’ ski area, without the resort feel of Whistler or the gaper factor of in-town ski hills like Cypress and Grouse. The chairlifts were a bit of an adventure (the lifties had to grab them and dig their heels into the snow to slow them enough for safe loading) but everyone was incredibly friendly, and we were both impressed by the amount of lift-accessed terrain. Lift lines, which started off crazy in the morning, thinned out nicely by lunchtime as AT-equipped skiers headed out into the backcountry. We left the hill with shaky, exhausted legs, soaking gear and the deeply satisfied feeling that comes from a day of massive snow. I’m really looking forward to getting to know Baker better this February while the circus is in town here in Canada. This entry was posted in Mount Baker on January 4, 2010 by Kay.